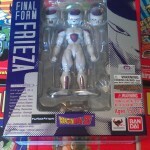 The latest release from in the Figuarts Dragon Ball line is the Final Form Frieza. 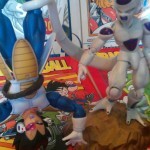 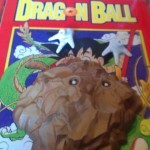 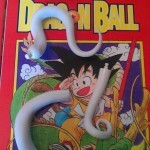 It’s the third villain in the series if you include Saiyan Vegeta and an awesome addition to any Dragon Ball collection. 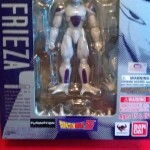 Frieza stands a lot smaller than the other figures in the toy line but comes with a lot more accessories than any of the others. 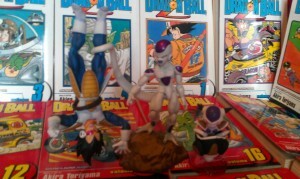 Because he is a bit smaller than the other figures in the toy line and still has the articulation it makes him really posable. 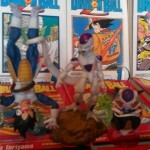 The extra feet give him great balance especially on the rock as one set of feet has pegs which will keep in place during an earth quake. 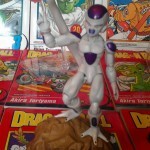 Paint wise it’s almost perfect, other figures have have suffered from either too much or not enough shading, the shading on Frieza looks perfect but the articulation on the shoulder is so tight they couldn’t paint all the purple bits which looks a bit off. 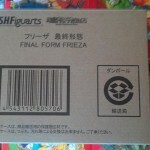 If you have been collecting the figures it’s a must buy just because of the lack of villains so far in the series. 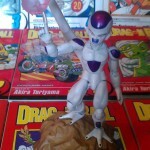 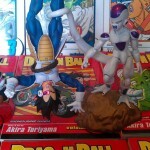 If I was a bit more adventurous I’d love to make a Cyborg Frieza out of a second one too. 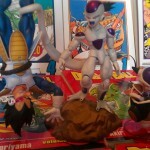 The only flaws with Frieza are as mentioned the missing paint on his shoulders and that they haven’t released a torn / beaten up Goku to fight him. 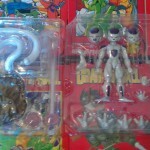 The Goku releases so far have all shared the same body mould which is a bit lazy but it leaves the toy line room to grow.